Want to make breakfast a little more fun? These cheerful crochet egg cozies are one creative way to approach it. They'll make everyone in your house start the day with a smile. Of course, some of these egg cozies would ​be fun to make for Easter. Here are more than 18 different crochet patterns for you to choose from. 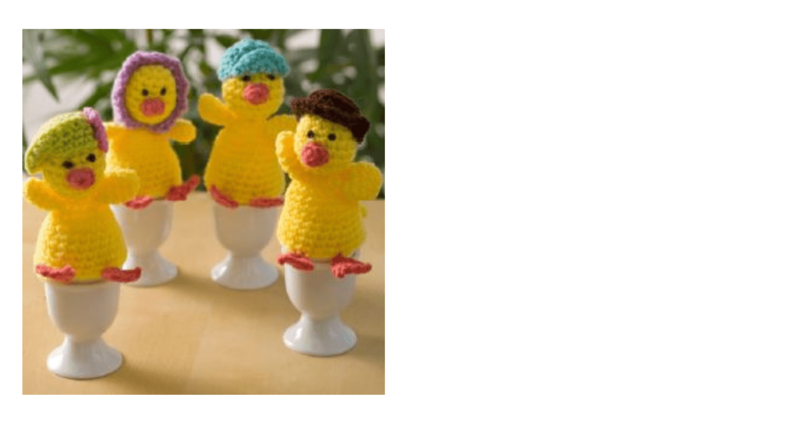 This is a family of egg cozies shaped like little chicks. Each one is basically the same, so they are easy to craft and yet they all have their own unique details to create a whole family. These little egg cozies look just like hats decorated with pom poms. They'll make your eggs look super stylish. This pretty set includes an egg warmer plus placemat and napkin ring. They are all done in matching spring colors with a floral design, making them a perfect choice for any table in springtime. This is another DROPS crochet pattern set and includes free crochet patterns for egg warmers and two different-sized placemats and a napkin ring. You can make the entire set or you can create just the pieces that are right for your springtime or summer table decor. This little crochet egg cozy is shaped like a chicken that is laying its eggs. It has a cute pompom for a tail. The pattern is easy to complete, based on simple single crochet and half double crochet stitches. The final size of the chicken is approximately 5 inches from beak to tail. Visually, it is sleek, chic and minimalistic. It's a nice contrast to the typical "cutesy" crochet egg cozy and would definitely work in many different kitchens all throughout the year. Dress it up in different ways depending on the button that you choose to adorn it with. Of course, this isn't really a square egg cozy, it's simply inspired by the ubiquitous granny square, one of the most classic motifs in crochet. It is designed to be made using embroidery thread, so it's a fine crochet design that can be created in really colorful thread selections that are perfect for Easter. At first glance, you can't even tell that an egg is hiding inside, so you easily could use this frog as decoration throughout the year even when you don't need an egg cozy. It's so cute. This fluffy little bunny-shaped egg cozy is crocheted using an eyelash novelty yarn. The result is a soft, cushy, adorable little Easter bunny that's enjoyable to touch and play with and cute for decoration at the springtime holiday. You can use this egg cozy pattern to make bunches of different egg cozy critters. The pattern is for the basic egg warmer shape and then there are endless adaptations based on your imagination. How about a robot-themed crochet egg cozy? Star Wars themes never go out of style. Most crochet egg cozies are designed to go over the top of the egg and cover it up. This one, however, is a bit like a mini Easter basket that holds the eggs for you. It's crocheted using T-shirt yarn so it's a great upcycling project! This cute little crochet pattern will turn your eggs into a garden of colorful mushrooms. This free crochet pattern for striped egg cozies (Brits call it a cosy) is written in U.K. terms with tips for adapting to different-sized eggs. This is a chicken-shaped egg cozy that would look especially great as breakfast table decor in a country-style kitchen. What are the eggeaters? Well, while it's up for debate, they look like creepy little cyclops egg cozies. But you be the judge by checking them out. This bunny will guard your eggs with its sharp little teeth and the button eyes will add pizzazz to egg cozy. Here's something you don't see every day. This egg cozy is shaped like a rat, and he's wearing a Grim Reaper-style costume. The design is based on the Death of Rats from the Terry Pratchett Discworld novels.